OH DUDES, I saw this in the latest Australian Gourmet Traveller and had to break my magazine embargo and buy it, just to make it. Well, this and the coconut cake on the front cover which looks divine*. I made it – I even made the dressing the way it says, with mortar and pestle (rather than bunging it all in the food processor) and OH.MY.GOODNESS. Eleanorfromthecommentbox and I had scoffed two bowls of it before we even got to the official eating location of the back verandah. It was a fitting dish for feeding her family (or parts thereof) too. So, as we stare down the barrel to some horrendously hot weather, this is the total solution. For those of you in snow, well, just make it regardless. 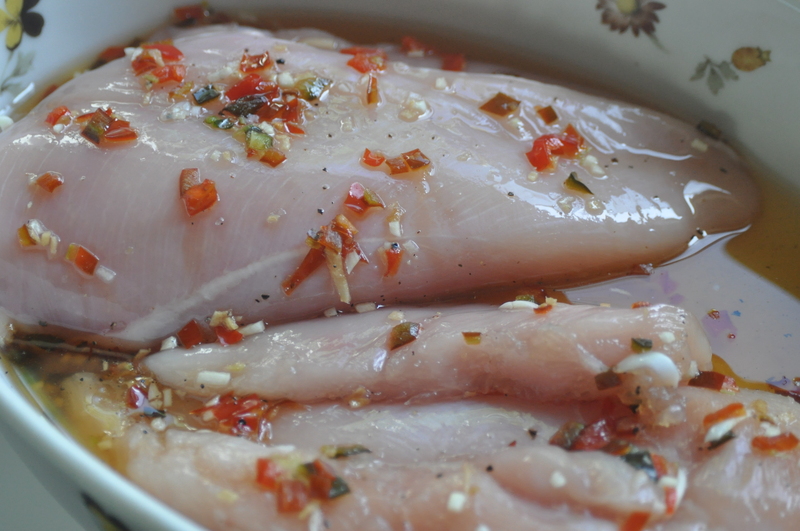 Combine the chicken with the honey, chilli, ginger and garlic in a baking dish. Season to taste and cover with foil and roast until chicken is cooked (about 12-15 minutes). 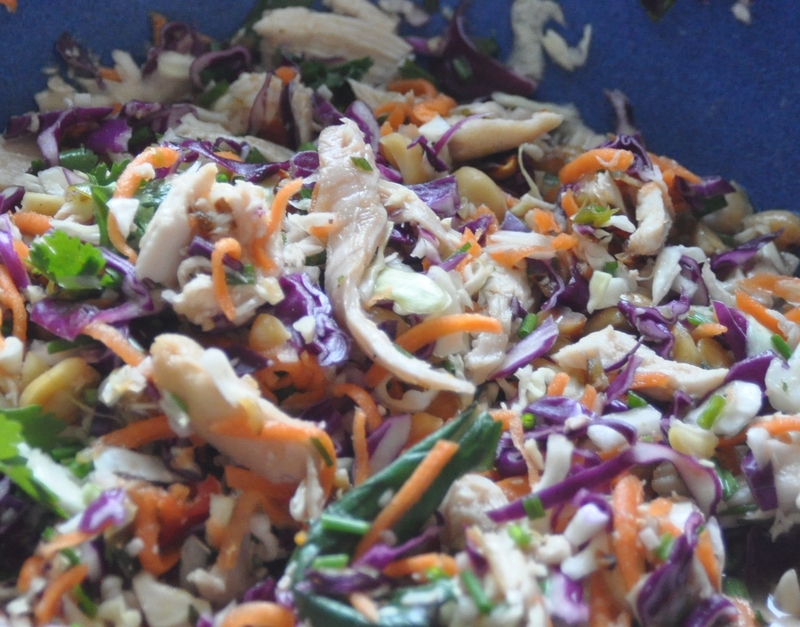 Remove foil and cool to room temperature, then coarsely shred the chicken and set aside. For the dressing, pound the chilli, coriander root, shallot and garlic in a mortar and pestle then add the tomato and pound to combine. Add 25ml water and remaining ingredients, adjust seasoning to taste and set aside. The dressing should be sweet, salty, hot and sour. 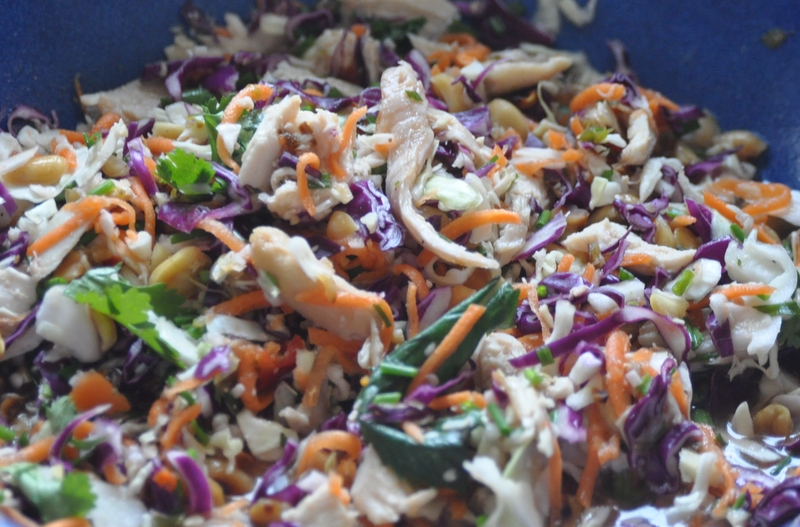 Combine the cabbage, carrot and herbs in a bowl, add chicken, drizzle over a little dressing and toss to combine. Add more dressing to taste, scatter with peanuts (and quail eggs if you wish) and serve. * But get this, the whole section on coconut has you MAKING your own coconut milk or cream by buying FREAKING coconuts. I mean, COME ON.